These building blocks have soft connectors so children can easily build with them. They are tactile and great for early spatial learning. On this 30-minute personalized DVD, blue-haired Billy speaks directly to the child who owns the DVD, educating him or her as he interacts with wild animals and encourages use of the imagination. A non-personalized version is also available. "We have over 400 unique names in stock, so product ships within 48 hours," Kris Olson, president of Kayo Media LLC, told TDmonthly. This product received an iParenting Media Award. Launch date: October 14, 2008. Packaged in a small tin, this product includes 15, 8 cm x 8.5 cm note cards and envelopes. "We start the thought. You finish it," the packaging says. Starter phrases include "You are especially good at ...,"You have a great way of ..." and "I remember when ..." The cards can be stuffed into stockings or lunch bags, and four other themes are available. Thought Cards won an iParenting Media Best Products Award. WowWee FlyTech Bladestar by WOWWEE GROUP LTD. This indoor flying machine features an Autopilot Mode with sensor-based navigation that allows it to avoid ceilings and other obstacles while gliding. It also comes with a three-channel digital IR remote controller, plush a Dogfight accessory for use when pitting two Bladestars against one another. 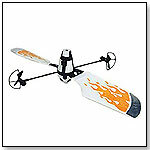 The crash-resistant Bladestar boasts lightweight "high-flex" materials and is for indoor use only. It has a 12" wingspan, and 20 minutes of charge time results in about five minutes of flight. It requires 6 AA batteries (not included). The product received a CES 2008 Popular Mechanics Editor’s Choice Award. Slooh Kids Volume 2 Activity Book by BLUESTORM PRODUCTIONS INC.
Each Slooh Kids activity book includes 14 celestial objects located in the northern and/or southern Hemisphere. It’s easy to launch, explore, and learn with the whole family. Kids can learn about space, then go see it LIVE using the Slooh mission card via Internet access on a Mac or PC. Kids can connect to three observatory site locations, learn how to plan missions, remotely control the telescopes, and take and print pictures, then paste them in the book. Access includes Live SkyGuide Audio. "Slooh is revolutionizing the way we explore the night sky," Patrick Paolucci, president of BlueStorm Productions, Inc., told TDmonthly. Slooh mission cards won a 2006 NAPPA Gold Award Honor award. Launch date: July 2008. Children can easily build this sturdy Pirate Fortress, decorate it, and play with it. This kit transforms from a crafting activity into a real toy, and, best of all, is recyclable. All pieces are made from pre-cut and pre-punched sturdy white cardboard and can be put together without glue and scissors. "It's a great choice for parents who want to promote their children's creativity, and it is a wonderful, unique present for a kid that wants a cool toy," Martina McConnon, owner of distributor Creative Toyshop, told TDmonthly. It received the Spiel gut 2008 award in Germany. Launch date: September 8, 2008. Zillio has 12 colorful staircases based upon multiplication tables. The visual and tactile relationships between steps enable kids to discover and master difficult math concepts as they learn and play with 10 essential math skills. Mini Zillio handles numbers up to 36, and measures 18" x 18" x 8", compared to Mega Zillio's 27" x 27" x 12.5". For up to 4 players at a time. Viewing products 721—730 out of 1181 products.